Hardanger embroidery is a form of embroidery traditionally worked with white thread on white even-weave cloth, using counted thread and drawn thread work techniques. 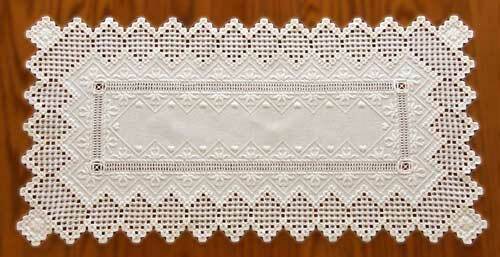 It is sometimes called whitework embroidery. Hardanger is held on Mondays from 9 AM to 11 AM in the Arts and Crafts Room. The Coordinator for Hardanger is Pam Horstman. The Arts and Crafts Room is also open to all for any needlework, quilting or sewing projects on Wednesdays from 5 PM to 10 PM. The room is also open to all crafters on Tuesdays from 5 to 10 PM, Saturdays from 3 PM to 10 PM and on Sundays from 5 PM to 10 PM.